I think this fairly well speaks for itself. Published on August 8th 1972 it is a two page newsletter from OSF with a message for the nation (this was donated anonymously as well – again, many thanks to all our unknown benefactors). And there is the Easter Lily at the top of the page. Strangely evocative. 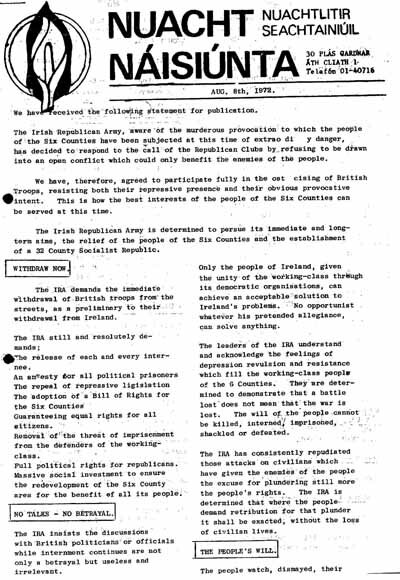 As was pointed out to me, interesting to see “Saoirse”, the support committee for Republican prisoners. What comes around goes around. Most interesting bit was the demand for a Bill of Rights so early. Hadn’t that been a demand pre-1972? Not sure. I’ve mostly associated it in my head with a bit later, 1973 or so, but maybe it had been. Most likely my ignorance. P.S. Any chance of a post on tonight’s Hidden History, on those who make history, and which I won’t be able to see? I’ll do my best. Might not appear for a couple of days though… Hard Drive isn’t exactly working properly… or at all! Fair play to you. No big deal though if you can’t manage it. Would just fit in nicely with recent posts, and make my life simpler all at once. Done and done! Looks very good. Good man. Look forward to it.